Colonialism, Slavery, Reparations and Trade: Remedying the `Past'? Addresses how reparations might be obtained for the legacy of the Trans Atlantic slave trade. This collection lends weight to the argument that liability is not extinguished on the death of the plaintiffs or perpetrators. Arguing that the impact of the slave trade is continuing and therefore contemporary, it maintains that this trans-generational debt remains, and must be addressed. 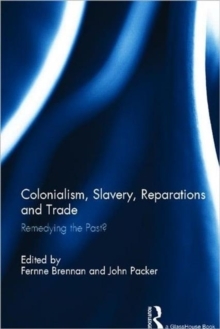 Bringing together leading scholars, practitioners, diplomats, and activists, Colonialism, Slavery, Reparations and Trade provides a powerful and challenging exploration of the variety of available - legal, relief-type, economic-based and multi-level - strategies, and apparent barriers, to achieving reparations for slavery.